The new second draft of the U.S. Public Participation Playbook incorporates changes that were proposed from nearly 100 suggestions submitted after the first week of public comment, with more improvements to come. We still need your contributions for this groundbreaking new collaborative resource to measurably improve our participatory public services across government, and would like to take this opportunity to share what we have learned so far. To start, let’s map out what the U.S. Public Participation Playbook is, how we’re building it to improve public participation with not just its content but the very process behind its design, and answer some common questions we received. What is the scope of the U.S. Public Participation Playbook? 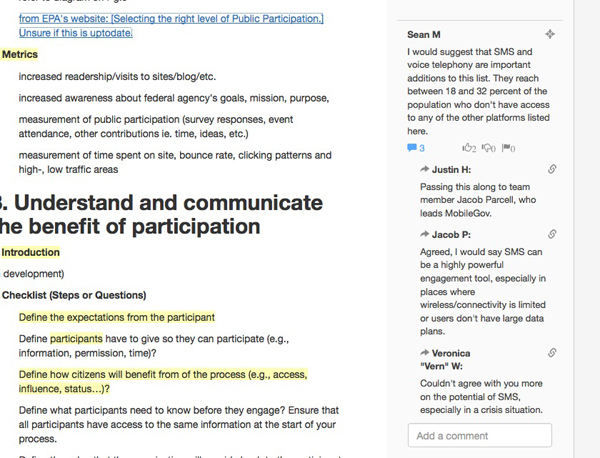 Many commentors requested a “working definition” of public participation, to better understand the context of the playbook. 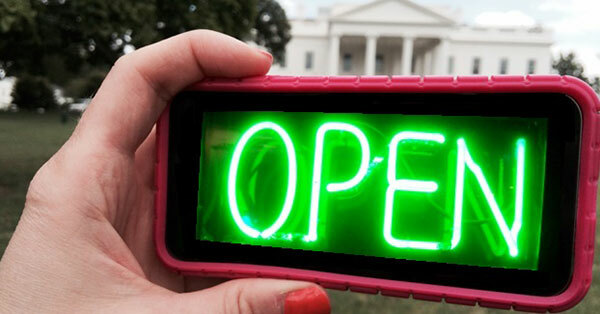 The White House National Action Plan on Open Government calls for the development of a resource that combines both best practices and suggested performance metrics for improving public participation in the federal government. The new introduction to the playbook is designed to capture this broad scope, but like all sections of the playbook, we still have work to do. What are the next steps for the Playbook comment period? We are very excited about the energy around this resource, and are thrilled that we have received nearly 100 constructive comments via Madison, email and in-person dialogues. We will continue collecting initial recommendations and comments using the Madison platform through Dec. 17, 2014. After this initial period, we will produce the first “official” version of the playbook for distribution in early January. In this draft of the Playbook, we have done our best to consider each of the comments we received to date. Some required discussion, while many were spot-on and just received a nod via “thumbs up.” Whether your ideas are visibly incorporated yet or not, rest assured, we’ve read each one of them and are working with them. What is an “effective comment” on the Playbook? Effective comments are “actionable,” meaning easy to place in context and evaluate for implementation. In the same way we look to refine data for better decision-making, the better you can shape your input for practical application, the easier it is for us to process and respond to. More than just effective comments, we’re working to improve our standard for effective responses. We’re kicking the tires on how we can better report direct correlations between each comment and the actions they result in, and look forward to improving this capability. What does the playbook need most for contributions right now? As comments on Madison point out, before Dec. 17 we’d like to focus more on the case studies and resources used to illustrate the practical application of the play. Ideally, we aim for six diverse resources each—currently some have many more, which we need to pare down to the most effective. Also, this week we’ve begun developing introductions to plays. Please take a look and help develop them into fuller representations. What’s next for the draft playbook development process? Dozens of federal managers, civil societies and other partners will continue to process suggestions as they are provided, as well as contribute their own insights and expertise. Today we release a new draft, and will release another one the following week that incorporates new feedback: three responsive public drafts before even the initial “formal” release. After the formal release of the playbook in January, it doesn’t mean the end—this collaborative resource will be introduced for widespread evaluation, implementation, and more contribution based on lessons learned during this initial process. While the playbook is designed to fulfill the need outlined in the White House National Action Plan on Open Government, we already see the opportunity to build and share more, and look forward to discussing with you how we will move forward. Who are the collaborators behind the U.S. Public Participation Playbook? Part of designing collaboration into the DNA of the playbook is not just creating a resource you can see the value in, it’s creating a resource you can see yourself in. For example, in the federal government we now almost doubled the size of the working group to more than 60 innovators from across diverse mission areas and job fields. This week we’d like to recognize them—and next week with the release of the latest draft, we’d like to recognize the civil society organizations whose contributions and voices have helped make this process so productive. Justin Herman is the SocialGov Program lead for the General Services Administration and is managing the U.S. Public Participation Playbook project. For more information on this project and to learn how you can participate, please contact him via email.